I know it’s way early for a Halloween post, but this project gives me the warm fuzzies. 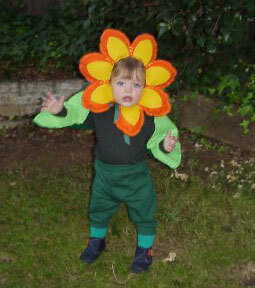 For M’s first “real” Halloween I decided to go all-out-Martha and make her a flower costume from scratch. It was frustrating, but ultimately very rewarding. I also treasure this one because every halloween since then, she’s insisted on assembling her own costumes. I bought her a green snappy turtleneck and sweats, as well as colorful felt and yarn from the local crafts shop. Tomas is the official Creative in the family so I solicited his help for the Art Direction. I’ll note here that the only frustrating part of the project was collaborating with T since I had a bit of trouble picturing what he was describing. The head-piece is just two layers of cut felt sewn together, stuffed, and sewn to a headband. I made a full circle so her head was surrounded by the petals, and tied off the ends. The leaves are also two layers of cut felt (one darker than the other for contrast). I left one end of the leaf open so I could slide it over her shirt-sleeves, and then cut slits near the end for her hands to poke through. I also added a bit of leafy detailing with a sharpie. All together, the elements cost under $25. It was worth every penny! He’s so cute! I love how easy this is, thanks so much for joining in.